Imagine you're twelve years old and suddenly discover that you're the returned Jesus Christ. You can turn water into wine, make the crippled walk again, and perhaps even raise the dead. What do you do, what does your family do, and how does it affect you knowing that you're destined to grow up and take part in a conflict that people have been waiting almost two thousand years for? 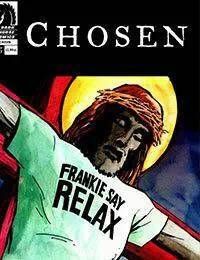 Chosen has been described in the British press as Spider-Man meets the Book of Revelations. SFX magazine describes it as Harry Potter for Christian fundamentalists. This miniseries is part of the much anticipated creator-owned Millarworld line of books from writer Mark Millar (The Ultimates, Superman: Red Son) and artist Peter Gross (Lucifer) and will be supported by ads in the other Millarworld titles from Image, Avatar Press, and Top Cow this month in the debut issues of Run, The Unfunnies and Wanted.